After reaching Istanbul in the afternoon we were dragged off to a Turkish night club for several hours of Turkish music, belly dancing ( actually boring after a few minutes) and folk dancing (which looked exactly like the folk dancing we had been subjected to in Athens.) Next morning it was off for a six hour tour of the city...or at least the European side of it. 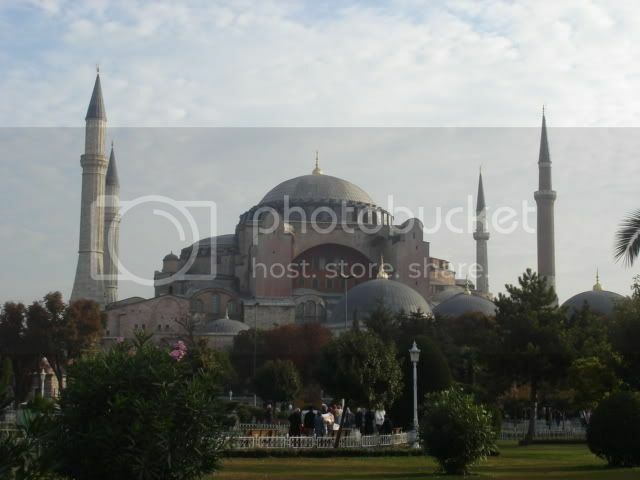 This was a park area inside the grounds of the Blue Mosque. 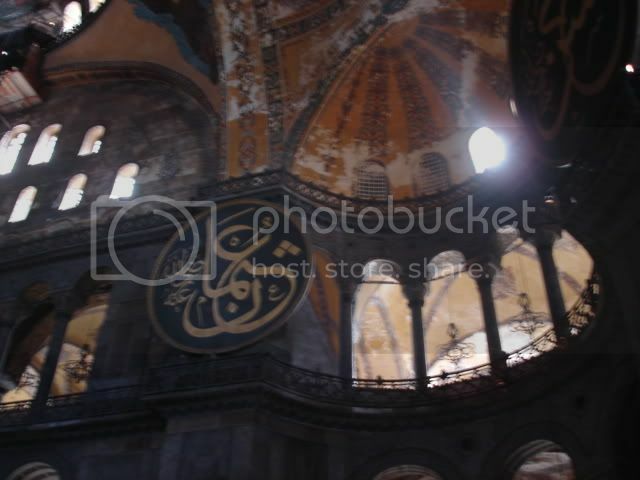 The Hagia Sophia but I'll get to this later with it's own segment. 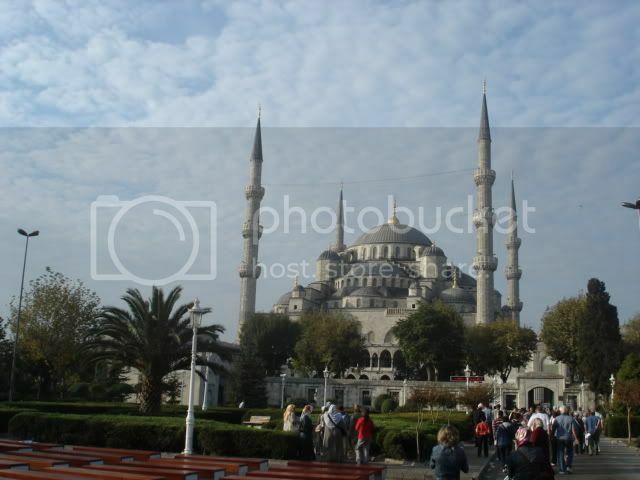 The Blue Mosque built by Sultan Ahmed or something. We did go into this one. I can't imagine the camera rig one would need to capture the grandeur of this place. I was lucky that I got some halfway decent shots without flash. 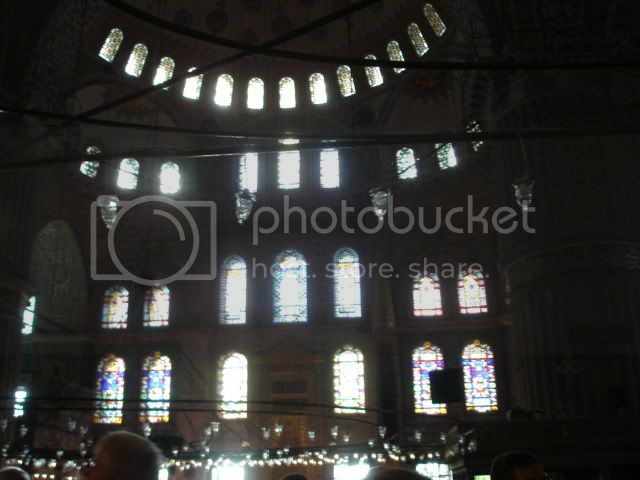 When the Turks took the city, one thing they apparently took a fancy to was stained glass and they adopted it into their building techniques. Religious syncretism at its best! Last edited by Minimalist on Sun Oct 21, 2007 10:57 am, edited 1 time in total. An Egyptian obelisk taken by Constantine to decorate the spina of the hippodrome. The actual race track is some 20 feet below street level and we later noted a wall with blue tape marking current archaeological sites where they are digging down on that floor. No word from our guide if Zahi Hawass is demanding it back. 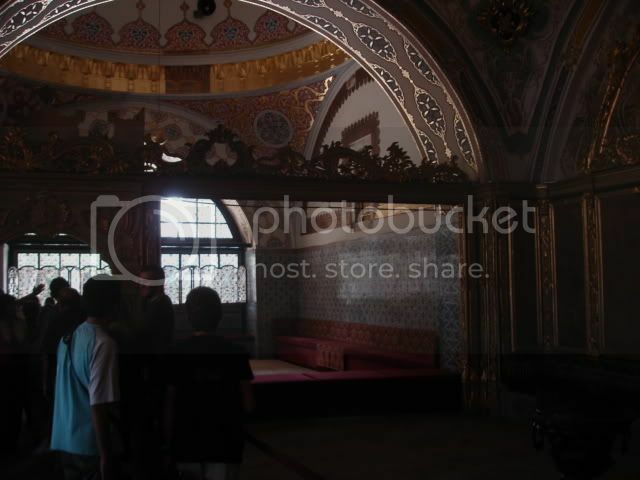 I took this shot inside the Topkapi Palace. I actually saw very little of this sort of overly conservative dress by women. These two stood out. It was a Sunday and there was a lot of family outing type stuff going on. We did notice many young girls wearing silken head scarves but our guide pointed out that this was more of a fashion statement than a religious revivial. To make his point he pointed out one young woman with a shiny red silk scarf....wearing a tank top and tight jeans. He said, "I don't think she is wearing it to dress 'modestly'." 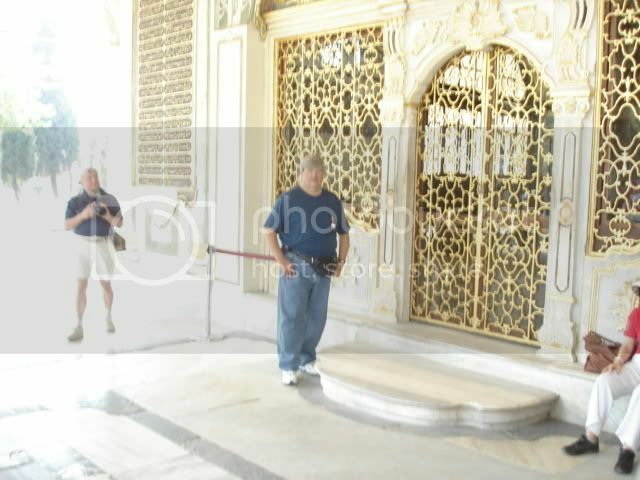 Topkapi is a museum for the most part and sits right on the Bosphorus. It houses several separate wings, one containing arms and armor but they frown on flash photography so this is the only photo that came out light enough to include here. Ottoman helmets from the 14th and 15th centuries. The Cabinet Meeting room.....it's good to be the king. Your's truly, hanging out by the gateway to the cabinet room. Yes, it looked like real gold and that probably explained the Turkish police station a few feet away. 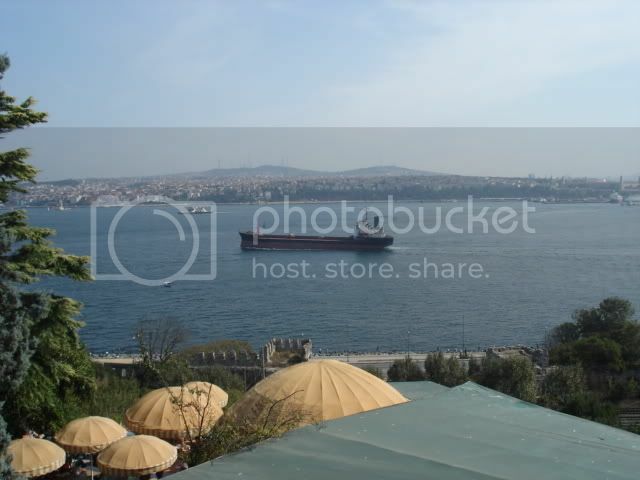 A ship heading up the Bosphorus towards the Black Sea. Asia is on the far shore. The umbrellas are part of a cafe where we had a forgettable lunch. Somewhere upstream is where Xerxes built his bridge of ships for the invasion of Europe. 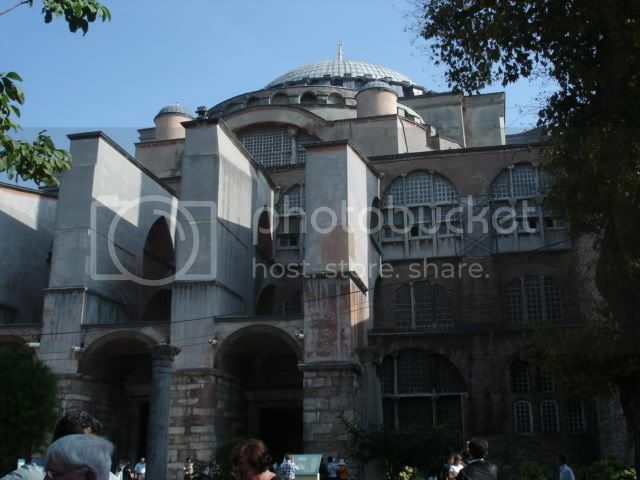 Leaving Topkapi, the Hagia Sophia is to the right and the Blue Mosque is dead ahead. These things were actually fairly close together. 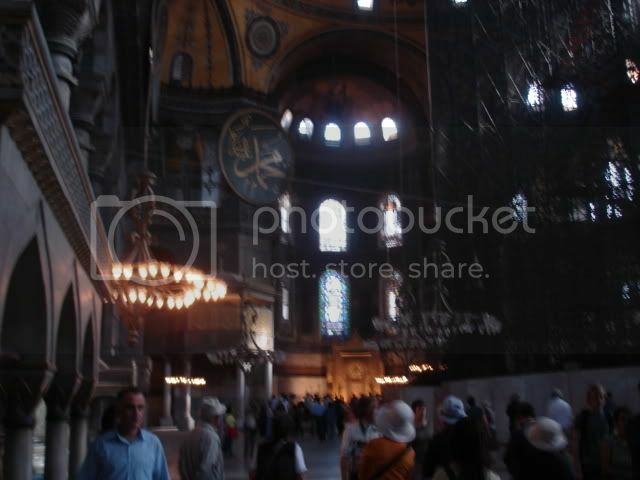 Hagia Sophia (Church of Divine Wisdom, in Greek) built by Justinian I in the 6th century AD. Largest building in the world until the completion of the Cathedral of Seville in the 16th century. 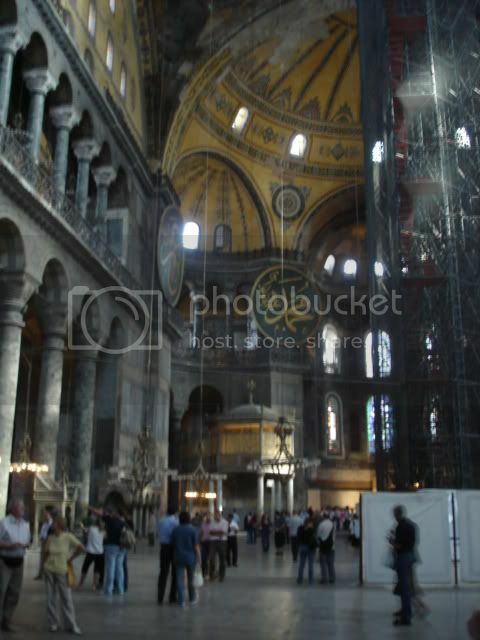 It has been heavily damaged by various earthquakes and the resulting repairs have meant that the dome is no longer round but more of an ellipse. Still....why quibble. The mosaics inside the main entrance. They looked to be between 40 and 50 feet high. There was a huge scaffolding inside the museum doing some work on the dome. The building is 1500 years old and is apparently something of a Handyman's Special. Our guide indicated that the work would be finished in another two years or so and the scaffold removed....earthquakes permitting. 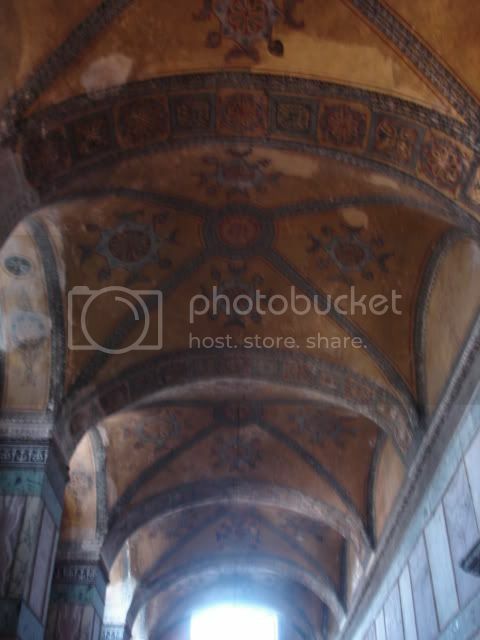 The Ottoman's plastered over some, but by no means all, of the Christian mosaics in the Church after the conquest. In some places they contented themselves with hanging these large shields, (leather...with quotations from the Koran) on the walls. One last shot of the interior. 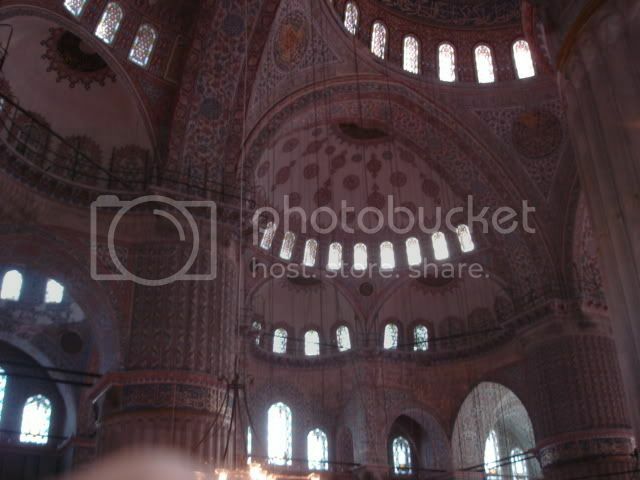 When President Ataturk closed the mosque and ordered it converted to a museum in the 1930's the process of removing the plaster from the Christian mosaics began...and still continues. It is apparently painstaking work and done at a bone-crushing distance above the marble floor. Waiting for the bus I took this last shot of Istanbul in a park outside of Hagia Sophia. Nothing special but I was astounded by how modern Turkey seemed to be. I noticed that they had stop lights which counted down the time before they changed colors. We could use some of that over here. 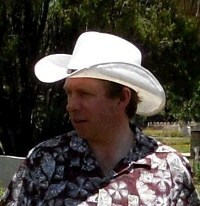 Our guide's English was flawless but so was that true of waiters and shopkeepers we dealt with. Apparently, when they teach languages in school they don't do it for 45 minutes per day. Our guide explained that in middle school you select a language and then for the next few years all of your courses are taught in that language. English is by far the dominant choice...which apparently pisses off the religious extremists who think that Arabic should be taught. Oh, well....they have them too! 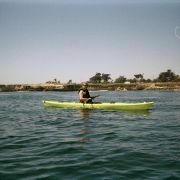 You are a great tourguide, Bob. This is actually very interesting. Fascinating stuff, I feel like I'm there. Hi Starflower. Good to hear from you. I hope all is well. Yes indeed. You've been too quiet, my dear. More wonderful photos, Min - almost feels like I'm there. I was in Fez in Morroco a few months back, and these remind me of that place, except cleaner and on a grander scale. Many of the women there wore headscarves, and Marian adopted the habit just because it seemed to make life easier. Not been to Turkey, but if it's anything like Morroco - one weird thing that struck me upon getting back to England is I was almost shocked to suddenly find myself again surrounded by billboards with semi-naked women on them and Islamic culture (leaving aside the significant religious element for a moment) suddenly seemed very civilised in this respect. Just for the record (re- Starbucks in the other thread), the inevitable McDonalds was there in Fez, serving (amongst the usual stuff) something called the McArabia. In 1995, in Rome, I was horrified to see a McDonalds next to the Baths of Caracalla. Now, I wouldn't be surprised to see a McDonalds IN the Baths.